Fat Frocks: Detox Your Wardrobe! Have you looked into your wardrobe recently and noticed how many items you never wear? 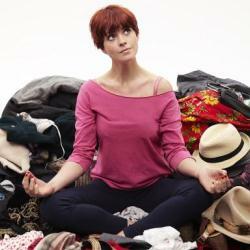 Isn't it time to 'detox' your wardrobe and help Cancer Research UK at the same time? One bag of clothes alone can do the world of good, so rather than slimming yourself down in January, slim down your wardrobe. Television presenters Dawn Porter, Konnie Huq and Lorraine Kelly are all backing the 'Detox Your Wardrobe' campaign. Charity shops are always in need to good quality donated items to sell. This is the perfect excuse to clear out all your unwanted clothes, books, DVD's and unwanted Christmas presents. Find out what you can donate, then simply drop your items into your local Cancer Research UK shop. Not only will you be de-cluttering, you’ll also be helping to raise money to fund the charity’s lifesaving research into the prevention, diagnosis and treatment of cancer so please get involved! If you don't live near a Cancer Research shop or would like to make a little money from your unwated clothes then you can sell on ebay. You can make a profit and make a difference at the same time by donating a percentage of the profits to Cancer Research UK. Your donated items could be worth more than you think! Last year Cancer Research UK raised over £52 million from generous donations of clothing, household and entertainment items made to their shops. A bag of donated clothes could sell for £30 – enough to buy two lab coats to protect scientists from harmful chemicals, and their experiments from contamination. Are you going to do the same? I will DEFINATELY be needing a wardrobe detox after all my january sale buys.....!will drop some things off next week i think! This is a great idea, will definitely be sorting through my wardrobe soon! I've got a tons of stuff to go through, for some reason I always seem to put it off but this has spurred me on to finally get a bag filled! KatieBarrett, Sarah and Alice- Yaaay, they really need good quality stock. A lot of charity shops were really hit by the bad weather and snow over Christmas and don't have many donations to sell at the moment so anything you can give will really help. I only mentioned Cancer Research specifically because they launched this detox campaign but I'm going to give some stuff to British Heart Foundation too because it's a cause that means something to me. I love giving to charity shops! In particular Save The Children, have you seen Mary Portas' shows about them? That's such an awesome idea! I'm planning on just donating clothes and stuff away because I don't live in the UK, but I plan to do my part.